Nigeria is Africa’s most populous nation, with a population of approximately 140 million people. 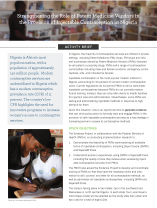 Modern contraceptive services are underutilized in Nigeria which has a modern contraceptive prevalence rate (CPR) of 11 percent. The country’s low CPR highlights the need for innovative programs to increase women’s access to contraceptive services.